Project Management activities are a finite set of activities dedicated to a particular outcome. The project management process consists of five main sequential activities which are adopted at the differing phases of project activities. This article aims to dissect the stages of project management, into manageable digestible concepts, to help clarify any misconceptions you may have pertaining to the subject. For the phase assessment, I’m going to utilize an organizational wellness program as the project example. Initiating a project represents the commencement of project management activities. As a background, let us assume that the medical department of your organization has identified that employee wellness programs are a good means via which your organization can improve its employee morale. Studies have revealed that healthier employees are happier employees, and one way of encouraging healthy employees, is to build into their work curriculum opportunities to exercise either before or after work. A rival company has successfully managed to incorporate a similar program, and their employee retention has gone up. After a suitable presentation to the senior management of the organization, the project’s feasibility and profitability are carefully assessed. Organizations no longer only focus on the bottom line, so if there’s an improvement to a quality standard in their overall operations, the odds of acceptance will be high. The medical administrator would present their case via a business case, which is a document that highlights the pros and profits to be gained from implementing the project. This would typically be in for form of metrics such as dollars saved, or employee absenteeism reduction. As long as there is a positive reaction to the project activities, and the managers feel that the savings to be gained from executing the activity are favorable, then the project will be approved and the next phase of activity – Planning is then incorporated. Typically, a business case document is outlined as a problem solving A3 in Lean and Six Sigma thinking. The business case value would have been determined by assessing the current condition of particular metrics. In this case, since the project is focusing on employee wellness, the critical wellness parameter prior to implementing the program, and subsequent to implementing the program would be assessed and compared. Additionally, since there would be literature involved, the anticipated changes due to implementation would already be scientifically proven. The case study’s methodology can then be transferred to the organization in question, and broken down into the critical process steps. Thought processes such as what tools will be needed to facilitate this transition? Will Fitbits help us, or can regular pedometers do the trick? How will we promote the campaign? All these questions…once answered, can be ordered into a format, a sequential and logical plan that can be executed in the next phase of the exercise. There’s a saying that goes “A goal not written down is just a wish.” Adding to this…is that even if a goal is written down, if it’s not acted upon, it will still remain a wish. After the project execution plan has been laid out it is time to facilitate the appropriate execution of the project. This often involves ensuring that the appropriate project ambassadors are recruited, and their services are offered the right place and time across the project time line. In the planning phase, the appropriate timelines for each activity would have been identified, so all that would be left for the accomplishment of the project is ensuring that the activities are facilitated. All resources would have been sourced, and the project value then created via synthesis of all these project activities to create the final outcome. What gets measured, gets managed in Lean and Six Sigma. When the project itself has been designed, and is being executed, it is important to ensure that accountability measures are in place to ensure an on-time delivery. If project activities are set for a particular due date, it is the responsibility of the project manager to ensure that the project management activities are being executed on time. If there is a delay, appropriate corrective measures are to be executed. If an activity is running ahead of schedule, that is always a good thing. 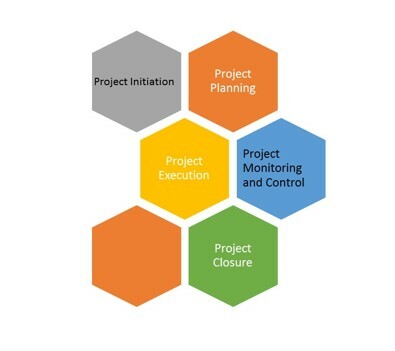 Critical project key performance indicators, cost allocations, and time are critical parameters to monitor across the project execution process. Projects are not intended to be ongoing activities. According to the project plan, certain activities are to be executed by a particular time. Once all critical project activities are executed, the project itself becomes complete. The project manager, as the project was being executed, would have been checking to ensure that all project time, cost, quality deliverables were being met. Once all deliverables are met, the project itself ends, and operational activities then take over. As acknowledgement of the project’s closure, a communication to the critical project stakeholders can be held. This could be done in the form of a meeting highlighting the project activities, and also any testimonials or demonstrations of the final product in execution. Inclusion of the project operational activities such as monthly organizational publications is a good means via which the stakeholders will keep the project at the top of mind. Many activities tend to stagnate due to lack of attention, so keeping up with the activities is a critical way of ensuring that the project continues to deliver value.